The deep excavation at the Oak Grove School construction site, the way it looked Sunday. 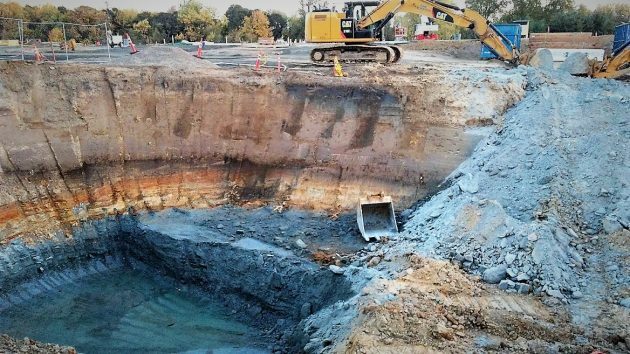 If you read Monday’s story behind the 25,000-gallon tank being installed at the new Oak Grove School in North Albany, you may have briefly wondered why the excavation for it was many times bigger than the tank. The tank has to rest on a thick bed of concrete over crushed rock. Then there has to be room to secure a system of steel cables to hold the tank down if the groundwater happens to rise. Also, the hole was made as wide as it is for safety, to prevent cave-ins and protect workers below as they install the tank and its fittings. I appreciate each and every one of your articles. Thank you. I think it is fascinating that the blue part of that soil is probably a million years or more old. I also thoroughly enjoy your very informative and interesting posts! Please keep up the good work! It seems that scientists studying blue clay from Oregon may have found therapeutic uses that kill some bacteria.